It’s that time of year againâ€”gather up your useful goods and bring them to Sunnyside Community House Dining Hall for our annual swap. We look forward to this event for the great thing that it is: a place to check in and swap around for fab new-to-you things before going to a store to buy them. You can sign up right now to become a swap sorter (the best way to see and have first dibs on everything that comes into the swap). Volunteers make it happen. On Friday, August 25, doors to the Sunnyside Community House Dining Hall (corner of SE 35th and Yamhill) open from 6-9pm to take in Community donations. Bring those jeans that don’t fit anymore, all the clothes your kids have outgrown, a lunch box or backpack with plenty of life left in it, sports gear, art supplies, books, toys and games. Everything should be in good, usable condition. On Saturday, August 26, the donating and swapping continues from 8:30am-7:30pm. Everyone who brought in items on Friday or volunteers their time gets in for free. Everyone who comes on Saturday without volunteering or donating in advance is asked to bring items AND pay a $2 per family fee. All fees and monetary donations will be donated to the Community House program that allows people to shower and get a hot meal there. 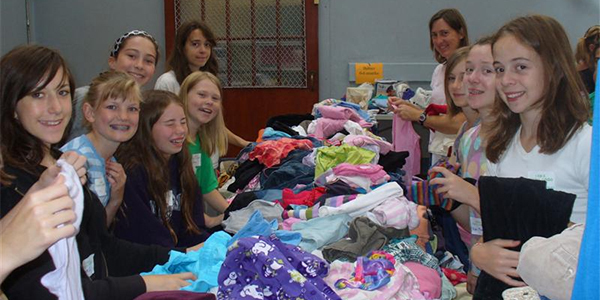 At the end of the swap, all remaining kids’ clothing items will be donated to the PTA clothes closet. Adult clothing will be left at the Community Center for those in need. We are looking for someone that works or volunteers for a nonprofit that would take away the infant clothing and any other baby items still left at the end of the swap. Let me know if this is you. Everything is free in the last hour! Spread the word to neighbors, family and friends; the more the merrier. Here is the Facebook link. Like, share and come to our event.